Many of you will know the magical powers of harissa. For those of you who don’t, you should. Harissa is a Tunisian hot chili sauce whose main ingredients include hot chili peppers, spices and herbs such as garlic paste, coriander, red chili powder, and olive oil. It is most closely associated with Tunisia, Libya and Algeria but its recently making inroads into Morocco and can be found in countries with a strong Arab presence like France and Israel where it is a common topping for falafel. 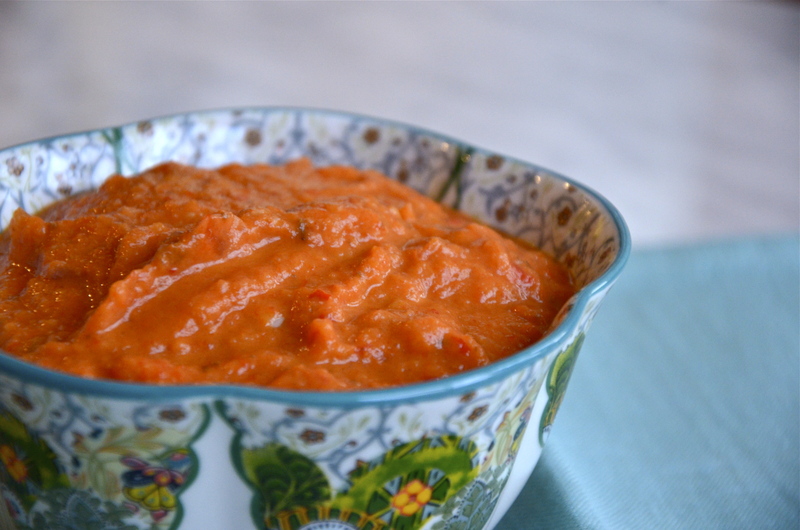 Recipes for harissa vary according to the household and region. Variations can include the addition of cumin, red peppers, garlic, coriander, and lemon juice. This recipe is from Ottolenghi and Tamimi’s Jerusalem. I love it in a not-so-discrete pile next to a Moroccan Tagine, drizzled on top of smokey lentil soup, or simply spread on an open face sandwich topped with whatever suits your mood. Place the pepper under a very hot broiler, turning occasionally for about 25 minutes until blackened on the outside and completely soft. Transfer to a paper bag or bowl covered with plastic wrap, and allow to cool. Peel the pepper and discard its skin and seeds. Heat the olive oil in the frying pan over medium heat, and fry the onion, garlic and chiles for 10 – 12 minutes, until a dark smokey colour and almost caramelized. Now use a blender or food processor to blitz together all of the paste ingredients until smooth, adding a little more oil if needed. Store in a sterilized jar in the fridge for up to 2 weeks or even longer. I love that book and I love Harissa, I can’t believe I haven’t tried this recipe yet! There’s a restaurant in Seattle that serves a great dish of chickpea purée, chickpeas, roasted carrots, Harissa, cilantro–I’m trying to remember all the layers. So good, I always mean to try to recreate it at home. Maybe some slivered preserved lemon? Mmm. This is fabulous … now i can visualize it. Not that I’m ever in Seattle but if I find myself there I know where I’m going…. I’m with Emmy– I just got the Jerusalem cookbook recently, and I’ve been loving it, but I haven’t tried making the harissa yet. Those toasts look phenomenal! 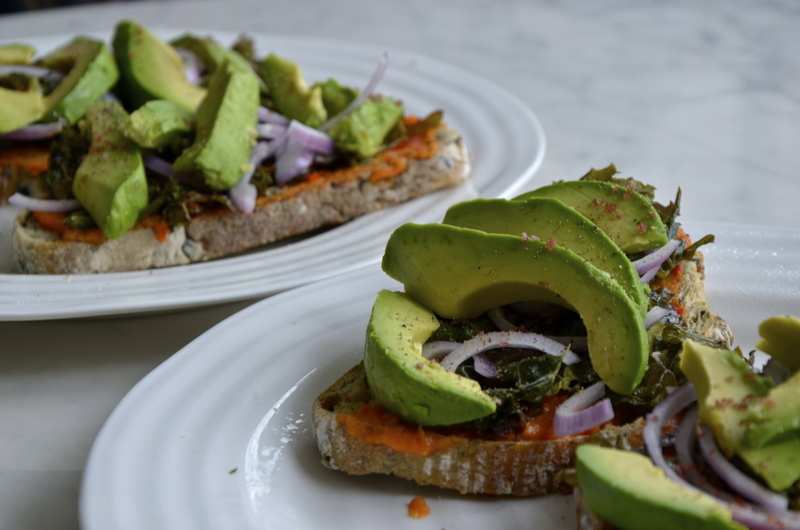 I can just imagine how well harissa and avocado go together… yum!